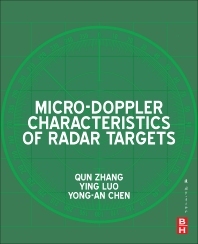 Micro-Doppler Characteristics of Radar Targets is a monograph on radar target’s micro-Doppler effect theory and micro-Doppler feature extraction techniques. The micro-Doppler effect is presented from two aspects, including micro-Doppler effect analysis and micro-Doppler feature extraction, with micro-Doppler effects induced by different micro-motional targets in different radar systems analyzed and several methods of micro-Doppler feature extraction and three-dimensional micro-motion feature reconstruction presented. The main contents of this book include micro-Doppler effect in narrowband radar, micro-Doppler effect in wideband radar, micro-Doppler effect in bistatic radar, micro-Doppler feature analysis and extraction, and three-dimensional micro-motion feature reconstruction, etc. This book can be used as a reference for scientific and technical personnel engaged in radar signal processing and automatic target recognition, etc. It is especially suitable for beginners who are interested in research on micro-Doppler effect in radar. Prof. Zhang is currently a Professor with the Institute of Information and Navigation, Air Force Engineering University, Xi’an, and an Adjunct Professor with the Key Laboratory for Information Science of Electromagnetic Waves (Ministry of Education), Fudan University, Shanghai, China. He is a Senior Member of the IEEE, a Senior Member of the Chinese Institute of Electronics (CIE), a Committee Member of the Radiolocation Techniques Branch, CIE, and a member of the Signal Processing Council of Shaanxi, China. He has published over 200 papers on journals and conferences. His main research interests include signal processing, clutter suppression, and its application in Synthetic Aperture Radar (SAR) and Inverse SAR (ISAR). Dr. Luo currently working in National Lab of Radar Signal Processing, Xidian University as a Postdoctoral Fellow, and also is an Adjunct Research Fellow with the Key Laboratory for Information Science of Electromagnetic Waves (Ministry of Education), Fudan University, Shanghai, China. He is a Member of the IEEE and the Chinese Institute of Electronics (CIE), respectively. He has published over 60 papers on journals and conferences. His research interests include signal processing and auto target recognition (ATR) in SAR and ISAR. He is currently working towards the M.S. degree in electrical engineering at the Institute of Information and Navigation, Air Force Engineering University, Xi’an, China.